Update: I wanted to welcome all the readers coming in from the Huffington Post. I hope you enjoy my shots and take the time to look at some of my other stuff as well. 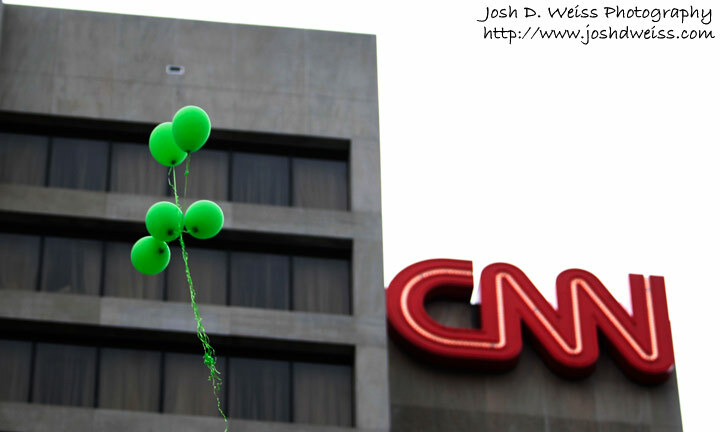 Today there was a protest for Iran at the CNN Center. Brett and I went down and shot for about an hour and a half and I submitted some of what I got to Zuma after I got home. The protest was interesting, there were actually two different factions that were there and both seemed to be upset about the other one, basically they didn’t trust each other from what I gathered. People on both sides were friendly to me however, although a few people wouldn’t give me their names. To each their own. Posted in Events, Featured, News, ZumaTagged atlanta, cnn center, georgia, iran protest, protestBookmark the permalink. Fantastic. Keep up the great work. Great photography; thank you for showing it. Thank you and many thanks to the Huffington Post!!! 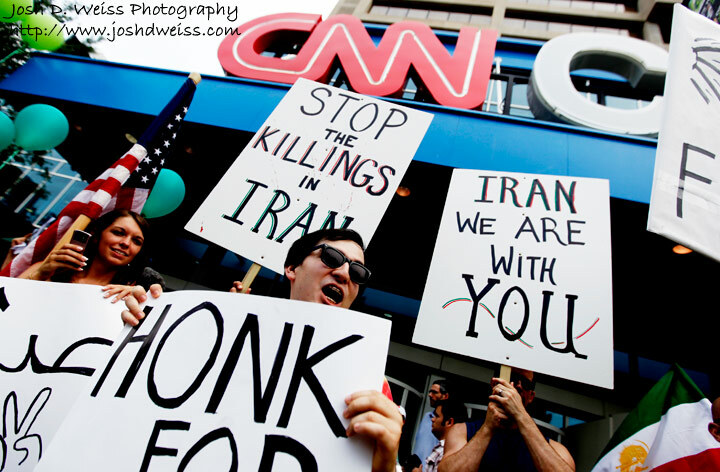 Shame on CNN, ABC, NBC, CBS, Fox and all the other news media for stopping coverage on Iran. Very powerful images, Josh. Many thanks for sharing. What was the difference between the two groups? Please contact me if you want info on the differences between the groups… it’s complicated. One group is not carrying out the peaceful message of the ‘Green Movement’ But our group is… we want revolution, but not a violent revolution. We do accept that violence will become a part of it… but our approach is peaceful before anything else. Facebook = amirali Irani (atlanta network) anyone is free to add me. 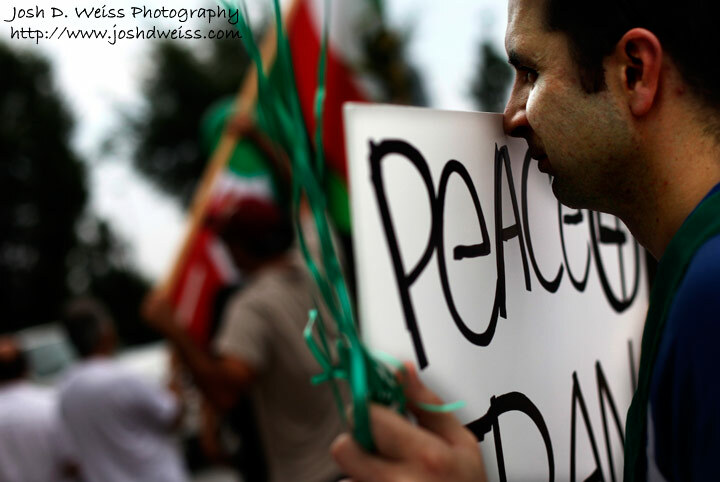 One group seemed to be more moderate, chanting primarily peace slogans while the other was chanting for peace and death to Ahmadinejad among others. Someone from the second group also claimed the first group was sponsored by the Iranian government. The person who said this couldnâ€™t give any real evidence that the group there was actually sponsored by the govâ€™t so I just tried to stay out of it. Hi Josh. Great photos! Since you’re answering questions, any idea of the crowd size? Probably around 200 people, maybe fewer. I’ve never been good with estimating crowd sizes though so take that with a grain of salt cause it could have been higher or lower. 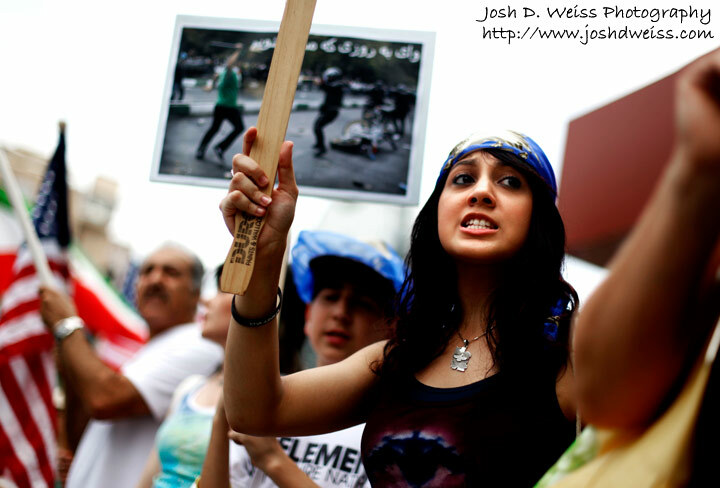 Unfortunately, Iranians outside of Iran feel they have a right to chant slogans. These groups are usually monarch supporters or Mujaheddin supporters. The flag with the gold lion mainly represents the Shaw’s regime. 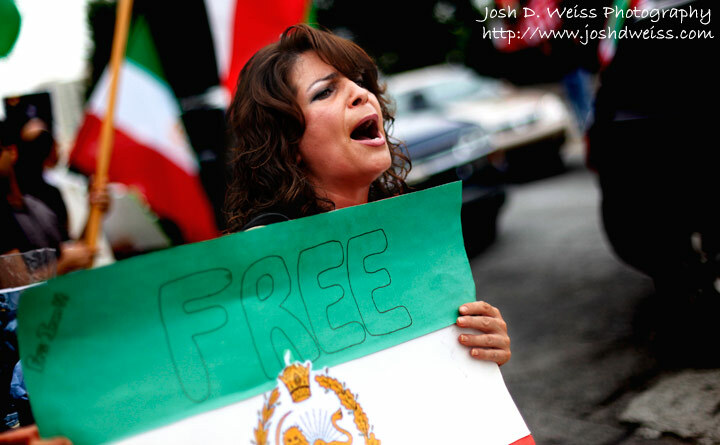 The other 90% of Persians are only demonstrating peacefully for human rights and democracy in Iran. 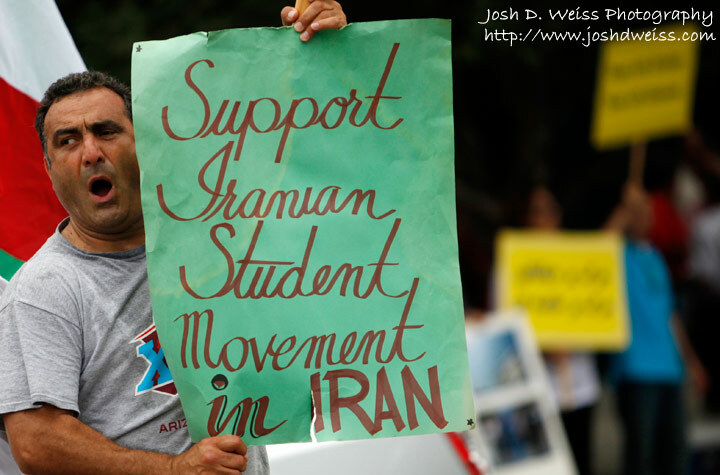 We feel we need to silently show support, so the voices of Iranians within Iran can be heard instead. The bombing which took place in at the Swedish embassy for example was done by one of those groups. These acts of violence and chanting of death solagans makes Iranians look back and deminishes the world support for our cause. By the way, thanks for covering this, great photos. Absolutely wrong information by “poppy” that suggests that the red, white, and green flag of Iran with the golden lion emblem is the symbol for the monarchists. This flag is the ancestoral flag of Persia for millenia. Of course because Iran/Persia from its inception around 2,500 years ago to 1979 — during jimmy carter’s presidency — was a monarchy might confused some who don’t really know their history, but the red, white, and green and golden lion flag was, is, and will always be the national flag of Iran. It was only altered/butchered by the khomeinists/islamist takeover after 1979 which made it to represent more the islamization than the national and historic character of the country. Great job. Glad you took some awesome pics of the movement and please keep up the excellent work. What is happening in Iran MUST not be forgotten and people like you will help make sure that does not happen. 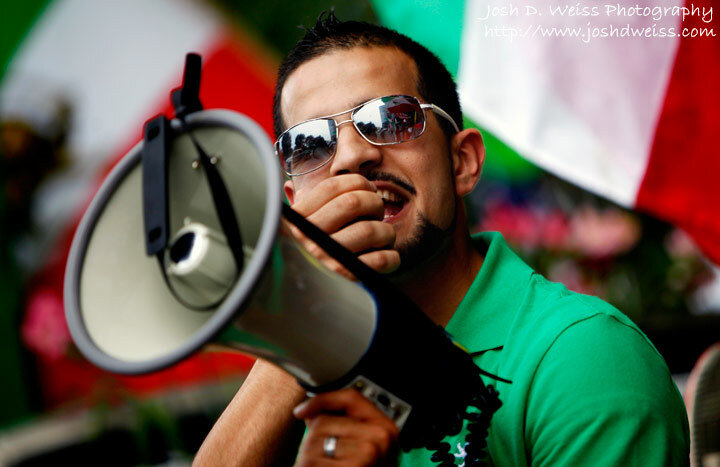 Please continue to bring the voices of Iran to the public. The world needs to know what is happening to innocent people who’s only request is Freedom. Great work. 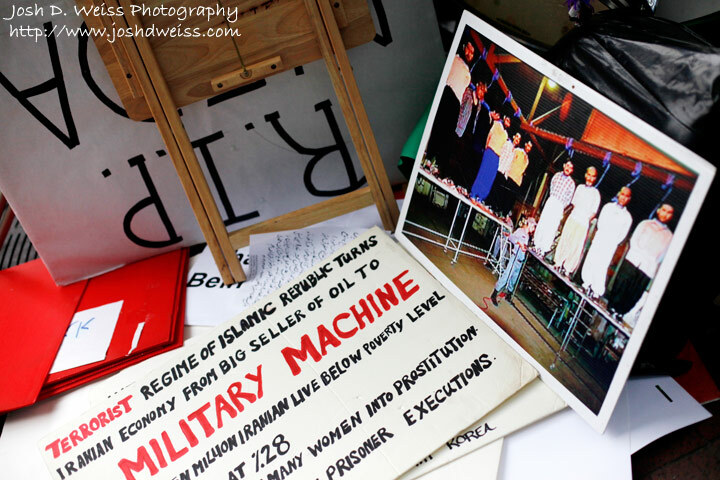 I was there yesterday and brought several friends to make a statement…I was there for the peaceful, awareness aspect of the campaign, and didn’t appreciate the “Obama-do more”/old regime flag waving/”death to Khaemini”/etc. activities but at least we reminded people that Iranians everywhere – including here in Dixie – are fed up and want democracy now and human rights for all Iranians. Thank you so much for taking such great pictures. It is true that there were two different sides at the protest. As many know, there are many political parties and positions in Iran. 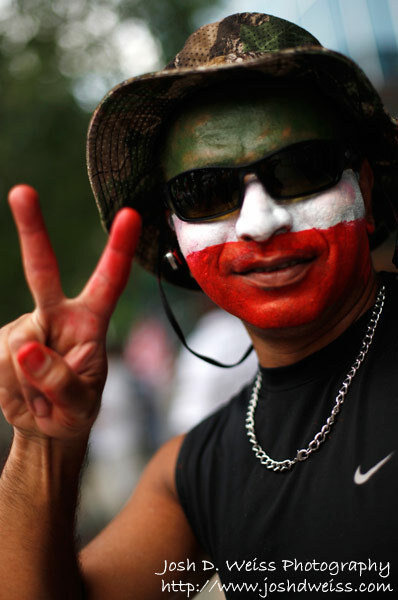 We went there to chant for peace and freedom for Iran. 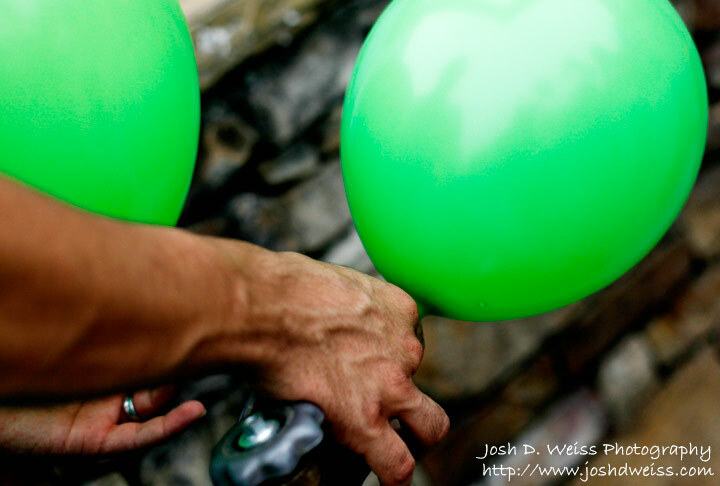 We wore the color green and released green balloons in the sky. 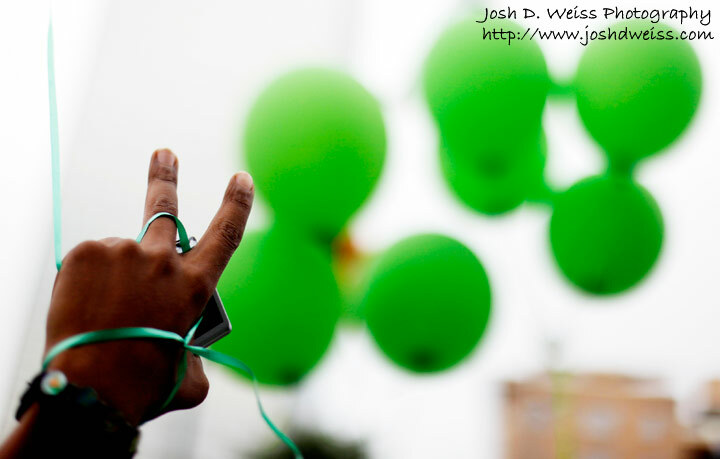 Green is now the color of a freedom movement in Iran. It no longer represents Moussavi for many. 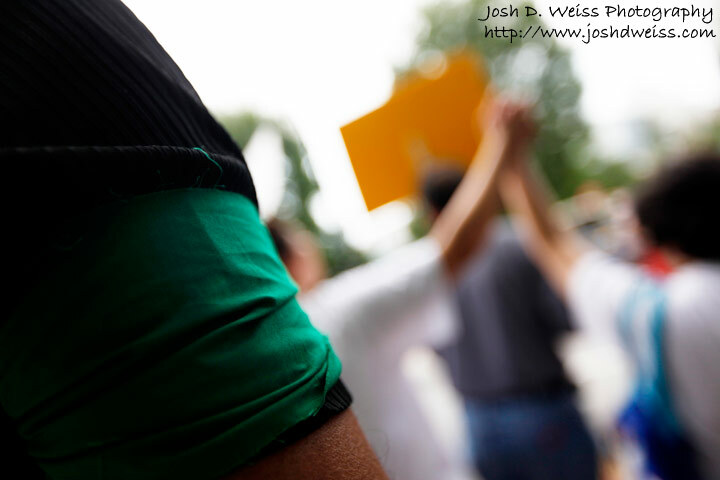 People protesting in IRAN are wearing Green because they are not able to make any other bold statements and they are obviously not allowd to wear the original Persian flag. We were wearing Green to follow those IN OUR COUNTRY who are fighting for freedom. We got many insults that we were part of the Islamic Republic because we were wearing this color. 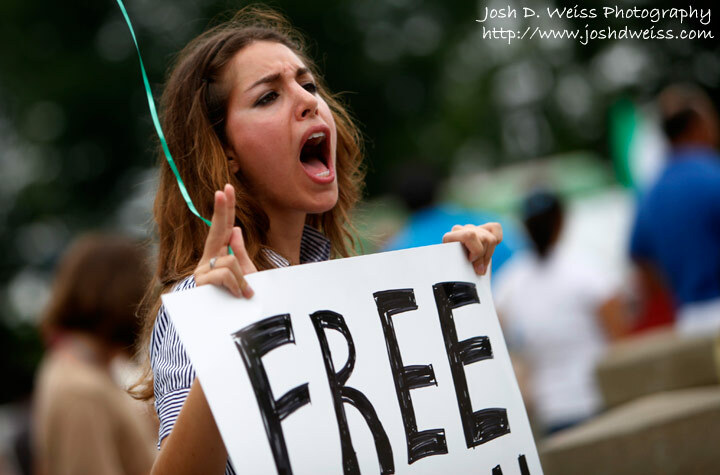 We ourselves know that this isnt true and we know that we want peace and freedom and by protesting we know that we aren’t going to get the message across by yelling “death…to this and death to that” It’s just not effective and it makes people seem just as violent as those who are killing people in Iran. What were the 2 factions & how do they differ? Or did you purposely avoid going into it, preferring to focus on the common goal? Please continue posting people pictures here. If people don’t want their picture taken surgical masks are available at every pharmacy created by mankind. Also, if you’re at a protest demonstrating against human rights infringements and crimes committed against an entire country, don’t be surprised if people are taking pictures. We will try to bring masks to all future rallies. hey thank you so much for taking pictures at the protest in atlanta. I was also there protesting. so please if u could please email me all the pictures you took besides the ones that you have posted right now. Sorry, I don’t send digital copies of my photos to anyone. could u please add more then? Great photo essay. Nicely done. Thanks for the great photos. 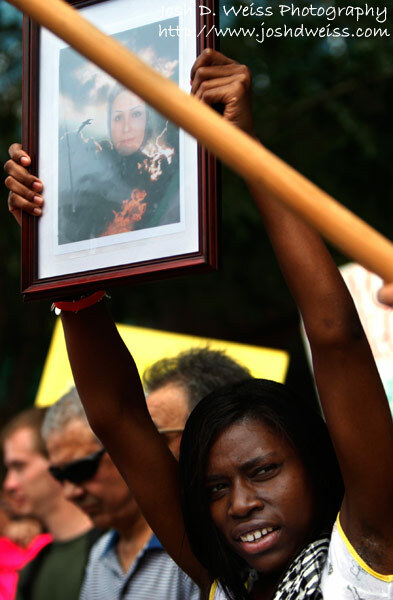 I was there – expressing my support for the brave people of Iran. 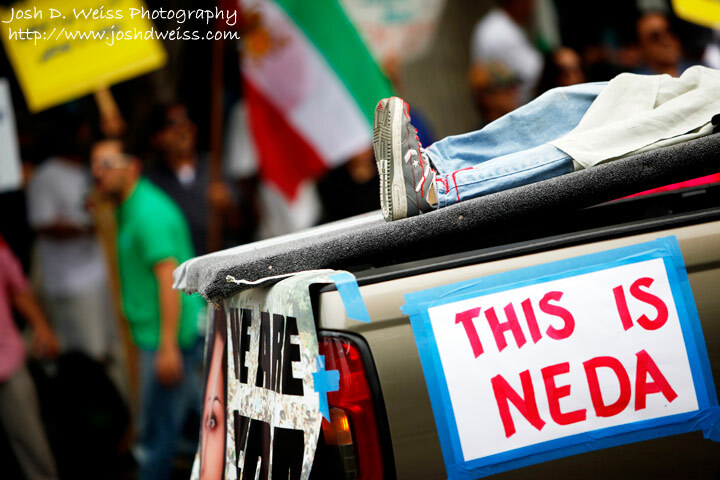 I was deeply moved (to tears), just being on the street, holding a photo of Neda, green balloons, and the flag of Iran, imagining I was on the streets of Tehran. 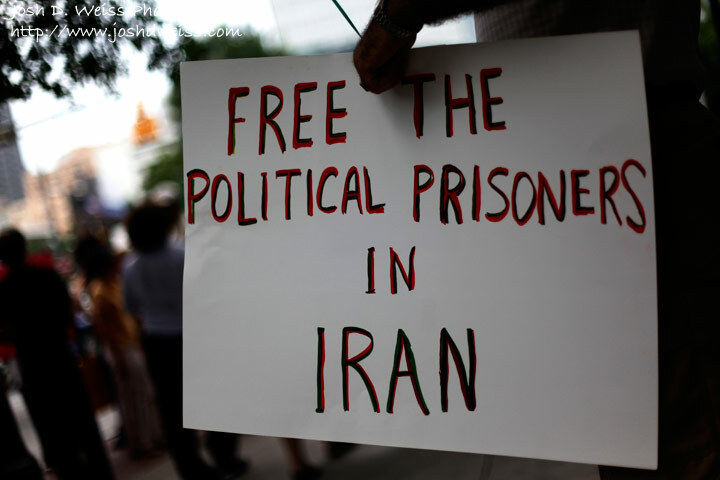 Their courage, fighting for freedom for Iran, has inspired the world. Nice work, good to know someone got some stuff to HuffPost, cause they never seem to want to use anything I do. 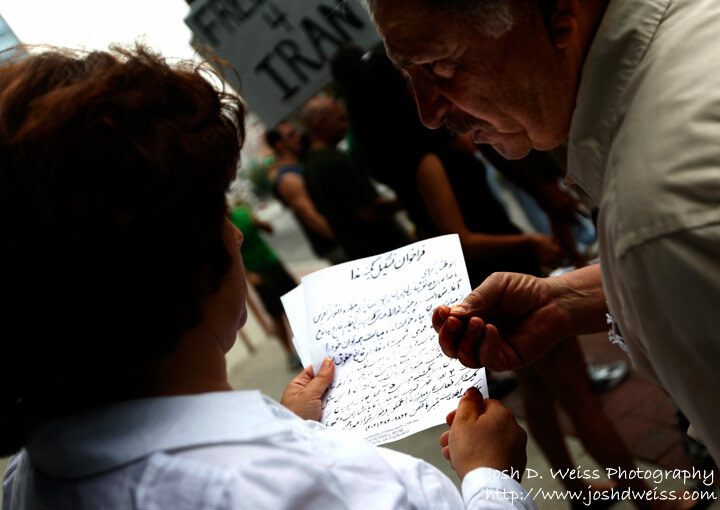 Please continue to bring the voices of Iranians to the public. Thank you for posting these images from the rally. Unfortunately I was not able to attend this one but I have photo set of the one that took place on June 20, 2009 in front of the CNN Center. 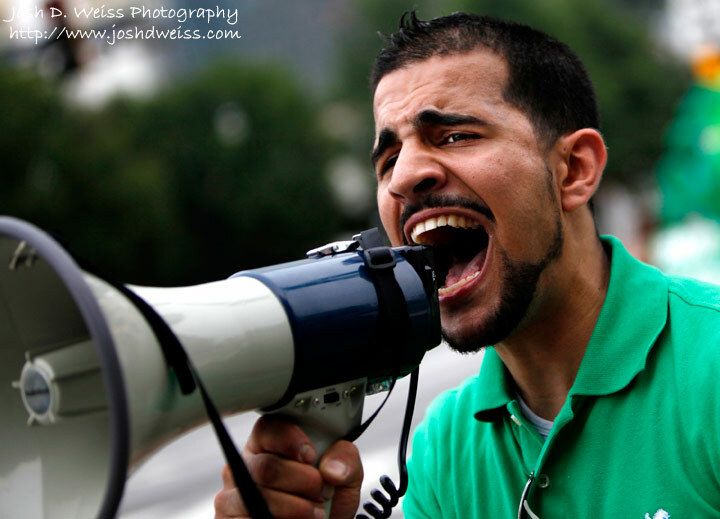 There were two other rallies I know prior to that demonstration and 3 in the following week, including the one in Piedmont Park for Neda’s vigil. That’s really cool that the Huffington Post published your photos. Thanks again for the great photo essay! It is pretty sad to see bogus postings like whoever this “poppy” poster is. Perhaps you had too many poppy seeds? Wow these pictures are great, especially love the one of the man in the green shirt raising a cry to the masses. Good work!